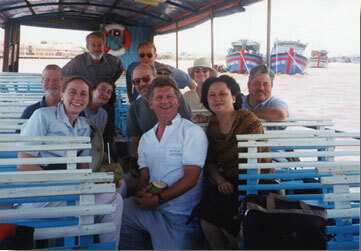 Dr. Uliana Gabara led a group of nine faculty members on a three-week seminar to Vietnam and Thailand. The seminar was preceded by several weeks of personal research and on-campus presentations, including a lecture by historian Dr. George C. Herring, Alumni Professor of History at the University of Kentucky. One of the highlights for participants was joining Lady Praneet Vacaharaphol at a dinner in their honor in Thailand. Lady Praneet is executive director of Thai Rath, a newspaper with a circulation of over one million. She also directs a charitable foundation that has built over 100 schools for needy school children.